The Guardian DataBlog has today made available information on all the contributions made to support the work of All Party Parliamentary Groups in the current Parliament. They found that 283 of the 450 groups received some kind of financial support from outside interests. The groups, often know as APPGs for short, are made up of MPs and Members of the House of Lords who share a particular interest in a subject or country and hold meetings related to their shared interest. Charities have long made use of APPGs as a way of raising awareness within Parliament and supporting those MPs and Lords who have an interest in a particular issue to raise questions with Government ministers and get involved in policy discussions. Together 20 charities contribute £97,763 to the costs of running 9 All Party Groups, with the Great Lakes Region of Africa APPG receiving the most (£27,500) and the Dementia APPG the least (£1866). The International Planned Parenthood Federation is the biggest contributor giving £12,356 to the Population, Development and Reproductive Health APPG and £5000 to the HIV/AIDS APPG. Christian Aid is the only other NGO which gives to more than one group, contributing to both the Great Lakes Group (£6000) and Agriculture and Food for Development Group (£3000), and development NGOs are by far the most generous providing just under £78,000 in total. The average contribution to an APPG is just under £5000. The use for most of the contributions is not specified, but 5 charities provide funding for an administrator while others are down as covering the cost of printing a report or costs of a trip for members of the APPG. 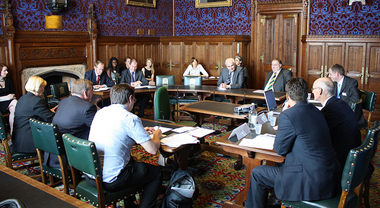 64 Charities provide secretarial support to a APPG. Almost all of the time this is support a group that is linked to the organisations purposes, for example the National Autism Society provides support for the Autism APPG, the Tibet Society to the Tibet APPG, etc. Results UK is the only NGO that provides secretarial support to more than one APPG providing it to the Global Education for All, Microfiance and TB APPGs. 5 APPGs report that charities have helped to support the cost of receptions or other events. No doubt some will suggest that this isn’t how charities should be using their money, but I personally think it provides good value. These groups have long been used as way of engaging and influencing busy MPs. Equally when you consider the bigger picture, that £1.6 million is spent on APPGs in total (so the charitable sector for 6% of the total) and the beer and wine industry can contribute £52,000 to the Beer group, I believe these figures are fairly modest. What do you think? Are supporting an APPG a good or bad use of money? In the interests of transparency, you can give the dataset that I’ve used adapted from the Guardian’s here. I’m happy to make amendments if notified of a mistake or inaccuracy (I’m human so expect that I’ve made a mistake or two). I have not included contributions made by Charitable Trusts or Foundations, or included Trade Associations which may in some instances be classed as charities. It is a very efficient way of buying influence. Lobbyists and trade organisations will often provide the secretariat for APPGs in order to frame the public debate over a certain issue. They aren’t stupid. The ethics of all this as a method of public advocacy are another thing I suppose.